Anyway, I was only 8, but I knew then: Men holding babies is a blessed thing. 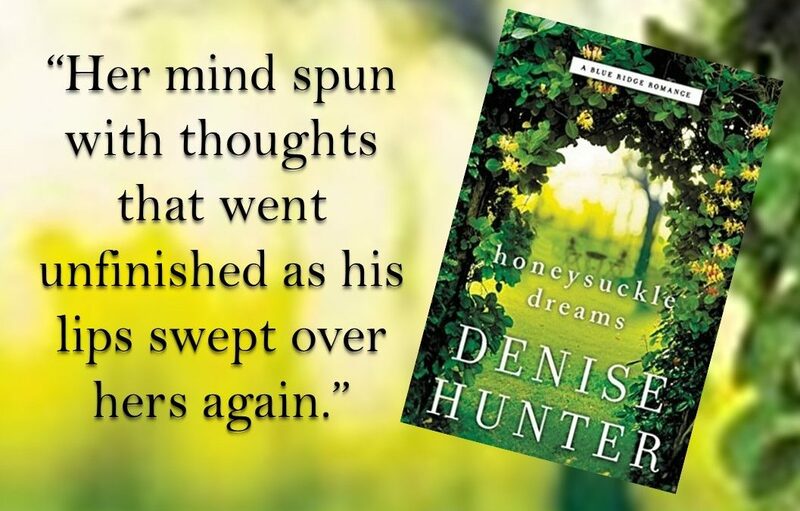 Denise Hunter’s latest novel, Honeysuckle Dreams, is a celebration of that. Brady Collins is the handsome, loving, and attentive single father of baby Sam. You may remember him from its predecessor in Ms. Hunter’s Blue Ridge Series, Blue Ridge Sunrise. He was Zoe’s adopted brother who had a Will They? Won’t They? relationship with his friend, Hope. I’m a huge fan of Denise Hunter’s. In fact, the moment I finished this book, I immediately grabbed another one of hers from my To Be Read mountain and dug in (Jade and Daniel’s story from Dancing with Fireflies…swoon!) If she had a fan club, I’d be in it. She doesn’t disappoint in this story. Hope Daniels is the best friend you’d love to have. Loyal and true, and always looking for a way to help someone in need. This time, that person in need is Brady, the guy you totally had a crush on in high school. You know the one. If he’d glanced at you in the cafeteria, you would’ve dropped your tray and fallen on your face? Okay, maybe that was just me. Anyway, Brady’s custody of Sam is called into question and he and Hope decide to work as a team to give baby Sam the best possible arrangement. What could be better than two best friends forming a lifelong commitment to raise this sweet child? Maybe the offer of Hope’s dream job in a big city? Overall, this story has everything that I love about a contemporary Christian romance novel. Survival after tragedy, trials of faith, conflict of desires, relatable characters, and of course, romance. Romance: 5 out of 5. Could two friends ever feel more than friendship for each other? Laughs awkwardly….um, yeah. By the end of the story, my heart wings were beating so fast, they had burst through my chest and flown two counties away. Well, almost. Faith: 4 out of 5. Lots of faith conversations and dedication to Christian ideals. Blushes: 5 out of 5. Because this story involves a marriage, conversations and intimacy reach a boiling point. But, ever tactful, Ms. Hunter portrays marital intimacy with the respect that it deserves. But it will still have you biting your lip. Tears: 4 out of 5. Between Hope’s backstory and baby Sammy’s custody battle, there were quite a few tears.LOLs: 4 out of 5. Great banter between characters plus “Ham-swollen fingers.” Enough said. Overall, I loved this story and highly recommend it! I will give this story a 5 out of 5! This is one of Denise Hunter’s best and I can’t wait for the final book in the series (about handsome Pastor Jack!!!) to come out in November! Until then, I’ll be forming my Denise Hunter fan club, complete with matching airbrushed t-shirts. I’ll be expecting that signed headshot any time, Denise!! If you want to read more reviews, be automatically entered to win my future giveaways and get exclusive content, please subscribe to my newsletter. No spam, just prizes!